Sri Lanka this week will make its first and important effort to grab attention in Switzerland›s ski resort Davos, which will host global business and political leaders for the 2016 World Economic Forum. Encouraged by the invitation to Prime Minister Ranil Wickremesinghe to attend the Davos Forum, a first for a Sri Lanka political leader, the Government and the private sector have joined hands to maximise the unprecedented opportunity. Over 40 heads of state and government, as well as 2,500 leaders from business and society, will convene at the 46th World Economic Forum Annual Meeting, from 20 to 23 January in Davos-Klosters, Switzerland, under the theme ‘Mastering the Fourth Industrial Revolution’. On the sidelines of the WEF 2016 spotlight, today the Premier will chair an evening ‘Sri Lanka Investment Forum’ at the Morosani Posthotel in addition to a VIP luncheon discussion tomorrow on ‘How to Investment in Sri Lanka’ at Swiss chalet Fuxägufer. Development Strategies and International Trade Minister Malik Samarawickrama, Finance Minister Ravi Karunanayake and Central Bank Governor Arjuna Mahendran will join Wickremesinghe as well along with Sri Lanka›s Ambassador to UN in Geneva, Switzerland, Ravinatha Aryasinha. Both events are organised under the aegis of the Swiss-Asian Chamber of Commerce with support from the Ceylon Chamber of Commerce and the Office of Sri Lanka›s Ambassador in UN Geneva. Joining the push by the Prime Minister is a delegation of leading Lankan business leaders. Brandix CEO Ashroff Omar, Carson Cumberbatch Director Hari Selvanathan, John Keells Holdings Deputy Chairman Ajit Gunewardene, former Ceylon Chamber of Commerce Chairman Suresh Shah, Colombo Stock Exchange Chairman Vajira Kulatilaka, Ceylon Biscuits Group Managing Director Sheamali Wickramasinghe, MTD Walkers Chairman Jehan Amaratunga, TW Corp. Chairman Thilan Wijesinghe, Virtusa Chief Operating Officer Keith Modder and Ceylon Chamber of Commerce CEO Mangala Yapa are among the Ceylon Chamber delegation along with two foreign investors Pierre Pringiers (Camso Loadstar) and Philip Richart (Lafarge Holcim). 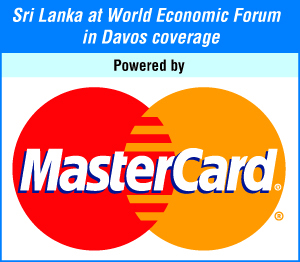 Additionally WEF›s only Sri Lankan member John Keells Holdings Chairman Susantha Ratnayake, Advisor to PM Dinesh Weerakkody, CSE Director Anton Godfrey, business leader Suresh Subramaniam and top professional Dr. Kapila Ranasinghe will be in Davos as well. Via the two events Sri Lanka will share the direct investment climate and discuss in more depth actual investment opportunities, facilitate a dialogue with actual players, stakeholders and project owners and provide testimonials of people who have been investing in Sri Lanka over the years. At today›s event Prime Minister will outline the vision for Sri Lanka in his keynote. Central Bank Governor Arjuna Mahendran will speak on ‘Policy Outlook for Sri Lanka: Economic Overview and Investment Opportunities’. Belgium Camso-Loadstar Chairman Pierre Pringiers will share a testimonial and investor’s perspective of Foreign Direct Investment in Sri Lanka. Other speakers include Mark Dangel – Chairman, Sri Lanka Chapter of the Swiss-Asian Chamber of Commerce, Zurich and Suresh Shah – Immediate Past Chairman, The Ceylon Chamber of Commerce. The event includes a panel discussion moderated by Tuck Seng Low – Member of the Executive Board, Senior Advisor, Swiss-Asian Chamber of Commerce, Zurich. At tomorrow›s VIP Luncheon, the focus will be on investing in Sri Lanka. CSE Chairman Vajira Kulatilaka will speak on ‘Portfolio Investments – The Easiest Way Investments Sri Lanka’s Public Debt and Equity Market,’ whilst an active private investor in the Colombo stock market, Patrick Schegg, will highlight prospects for private equity and venture capital. Edward Fernando – CEO, Greenkeepers Ltd., Textile Recycling Venture Sri Lanka – will highlight ‘A Local Entrepreneur’s Approach to Combine Business and Resource Efficiency,’ ‘Importance of Early Stage Capital; Real Estate Developments – The Safe Way’ by Beat Sutter and Andre Weber – Swiss-owned beach properties and sustainable tourism – and Naveen Anandakumar BDP, London based real estate developer in City of Colombo. ‘Sri Lanka Manufacturing Hub: Private Sector FDI – The Corporate Way’ will be dealt by Philippe Richart – CEO of Holcim Sri Lanka and Pierre Pringiers, Chairman of Camso Loadstar Ltd., Belgium. ‘Foreign Direct Investment via DFIs – The Public Way’ as well as ‘Investments by Development Financial Institutions (DFIs)’ will be highlighted as well. The luncheon will be concluded with a panel discussion on ‘Investing in Sri Lanka – Investment Climate and Legal Framework’ moderated by Mark Dangel (SACC) and Mangala Yapa (CCC).